This story highlights the value of teamwork – among loving owners, the referring veterinary community, veterinary surgeons and nurses – and the incredible healing capacity of a puppy. Only 6 months old, Fawkes had been in New York City just one week when the unthinkable happened – he and his new adoptive mom were both hit by a car. 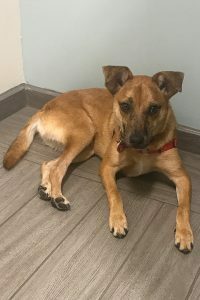 While mom was rushed to the hospital with a broken foot, Fawkes’ dad brought him to their primary care veterinarian, who provided initial treatment before referring him to the surgery service at BluePearl in Downtown Manhattan. 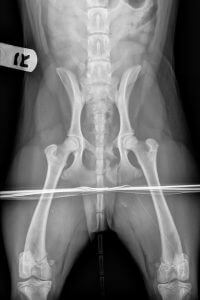 Fawkes presented with multiple pelvic fractures and a medial de-gloving wound of his right hind limb. 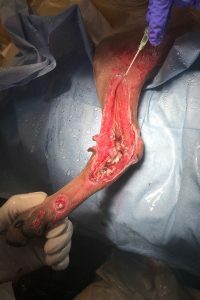 He had lost all tissue overlying the tarsal joint: the tarso-metatarsal joint was completely exposed; there was questionably necrotic tissue at the borders of his wound; and the stability of the joint was in question. 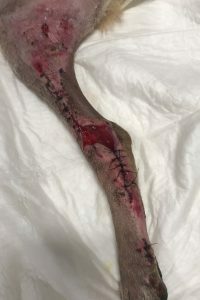 No major bones were broken, but there was some question as to whether there was a fracture of the medial malleolus of the tibia, and without stressed-view radiographs to assess joint stability, this added to our concern for damage to the medial collaterals. 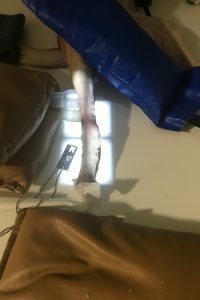 There was also a wound over the insertion of the common calcanean tendon that made us concerned about the integrity of the extensor tendons. 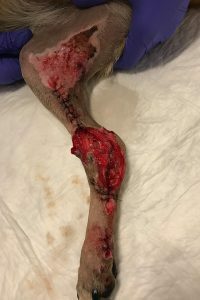 We determined that any major decisions about joint stabilization would likely wait until the wound had declared itself and healing was underway. 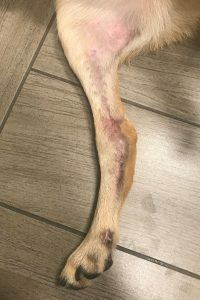 Fawkes’ pelvic injuries were to portions of the pelvis that heal well with conservative management, so we were able to focus entirely on his wound. 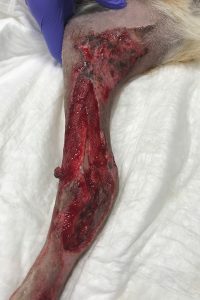 We considered two major treatment options: debridement followed by a “wet to dry” type bandage to allow for further dead tissue debridement, or use of the VAC or negative pressure wound therapy system. The VAC uses open cell foam and a continuous negative pressure of 125mmHg to help remove discharge from highly exudative wounds, increase oxygen tension at the wound bed, and speed the production of granulation tissue. It is, however, an intensive and expensive inpatient therapy. Given Fawkes’ age and his likely excellent capacity for wound healing, we elected to proceed with traditional bandage care. A lateral splint was added to the soft padded bandage given the questionable stability of the joint. We performed daily wet to dry bandages with a sterile saline and gauze contact layer for 5 days, followed by bandage changes at decreasing frequency based on wound discharge. 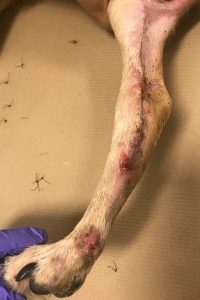 By day 5, Fawkes had already begun to produce a remarkable amount of healthy granulation tissue, and the contact layer in the wound bed was changed to calcium alginate. Closed portions of the wound were covered by Adaptic®. At day 7, partial staged closure was begun, and by day 35, sutures were removed! The splint was downgraded to a soft padded at 2 weeks, and the bandage removed entirely at 6 weeks. The medial side of the tarsal joint is composed of the tibia (medial malleolus), the talus (forming the tarsocrural, or tibiotarsal joint), the central tarsal bone (forming the talocentral joint), the numbered tarsal bones 1 and 2 (distal intertarsal joint), and the metatarsal bones 2 and 3 (tarsometatarsal joint). The soft tissue support of the joint is composed of the long and short medial collateral ligaments; both originate from the tibia: long band inserts on the first, second, and central tarsal bones, and the talus. It is tight in extension and loose in flexion. The short medial collateral consists of two portions, the tibiocentral (taut in extension, loose in flexion) and tibiotalar (taut in flexion, loose in extension). This tibiotalar portion is the most important component. Positioning for stress view radiographs. In order to assess joint stability, “stress view” radiographs are required to create tension on these ligaments and see if the joints involved become too open with applied pressure. Stress views at day 6 post- injury and repeated at 26 days confirmed that Fawkes’ joint was stable. By day 35, Fawkes’ wound was healed, but there was a small pinpoint focus of discharge. We were concerned that this could represent just a sterile suture reaction… or it could be an infection that could derail all of our progress. Given the joint involvement of his original injury and the catastrophic consequences of untreated joint infection, we cultured the discharge and found a multi-drug resistant Staphylococcus pseudintermedius sensitive only to chloramphenicol and amikacin. After careful consultation with his owners, a course of chloramphenicol was begun, and was well-tolerated. At our last recheck exam 11 weeks post-injury (and 3 weeks following completion of antibiotics), Fawkes’ wound was completely healed, and he was walking without any residual lameness. Fawkes on his last visit.